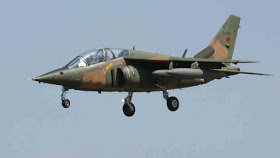 The Nigerian Air Force has confirmed that two of its planes participating in the rehearsals for Nigeria's Independence Day 58 crashed in Abuja. A statement by Air Commodore Ibikunle Daramola, Public Relations and Information Director, states: "I would like to confirm an airstrike in which two Nigerian Air Force aircraft participated in the 58th Independence Day rehearsals." Thank God, nobody died. Details will be communicated later. Many Thanks"